Do bread machines without Teflon pans exist? On average we get about 1-2 messages per week asking us if we can recommend a bread machine that doesn’t use a Teflon pan. Sometimes we wonder if we should tell everyone to direct those comments to all the bread machine manufacturers (hint hint) to pressure them to make, how should we call it, “less risky” pans. Instead of answering everyone one by one, we thought it would be best to finally put together an article that addresses this evil, man-made, mass-produced thing that’s gotten so many people concerned for their families’ lives. We completely understand! Teflon is a brand of polytetrafluoroethylene (yes a mouthful), which is also known as PTFE. It is used in almost every cookware you can imagine – frying pans, baking sheets, etc. This material is prized for its ability to resist sticking, which makes cooking and cleaning less of a chore. It has been used since the 1940s when following WW2, many new technologies at the time had found applications in daily life. Today, if you see some verbage like “nonstick” on cookware, it’s most likely made of PTFE. The problem with PTFE is that it’s been discovered to have adverse effects on health. Precisely, if PTFE is heated over a certain temperature, its molecules start to break down and it releases a toxic byproduct gas called perfluorooctanoic acid (PFOA). Studies on animals have found that PFOA increases the risk of liver, testicular, breast, and pancreas cancer, which you can read more about here if you’d like. “No known risks” is hardly reassuring though, and we suspect that that’s the reason most people would rather stay away as much as possible from this material. 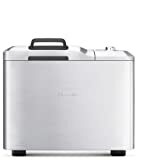 But even after doing many, many bread machine reviews, we have yet to come across any bread machine in North America that we can 100% back as having a completely safe, non-PTFE pan. We’ve heard of new material called Biolon, which apparently is a ceramic-based coating that is PFOA free. But right now we feel it’s another man-made product that deserves just as much scrutiny as PTFE. So what CAN you do to keep your family safe when using bread machines? Well, PTFE holds up fine at up to 500°F / 260°C of continuous use. Therefore an obvious solution might be to minimize your risk by ensuring your bread machine doesn’t reach a dangerous, fume-releasing temperature. The good news is that this is really easy. First of all, bread traditionally bakes in an oven at around 350°F / 175°C, which is significantly lower than the 500°F / 260°C maximum limit. We also found that with many bread machines, bread bakes at an even lower temperature (300°F or lower) and you can customize the temperature too. Bread machines bake bread at a lower temperature because unlike a conventional oven, the chamber is much smaller and therefore the heating elements are closer. This creates an environment that requires less heat to cook. So with bread machines, compared to cooking pans for instance where you can’t accurately control temperature, you realistically have little to worry about in terms of the release of toxic fumes from the nonstick pan. Below, we share with you some of the best bread machines readily available in North America that have the option to set your own baking temperature, as well as their temperature ranges. Note that all of these bread machines bake at 300°F or lower. The Zojirushi BB-PAC20 has a customizable baking temperature range between 250°F and 300°F (120°C and 150°C). Read our review here. The Breville BBM800XL has a customizable baking temperature range between 140°F and 300°F (60°C and 150°C). Read our review here. The Zojirushi BB-CEC20 has a customizable baking temperature range between 250°F and 290°F (120°C and 140°C). Read our review here. Did you ever ask why they were looking for a stainless pan? I can almost bet a lot of them are bird owners. Most bird owners won’t risk their birds lives so even a minimal risk isn’t worth it. I’ve owned parrots for 29yrs and finding safe products is always on my mind. So if manufactures would only listen they could have a huge new set of customers. I would love to own a breadmaker but have to settle with making it in an oven. Lol a safe oven. I found One company who sells a break maker with a stainless steel basket. Unfortunately, they do not sell in US or Canada. I will have to settle for the oven also, as I have just noticed this – they are all coated with Teflon with another name.